Israeli soldiers invaded, on Tuesday, several Palestinian communities in the southern West Bank district of Hebron, searched and ransacked many homes, and kidnapped nine Palestinians. 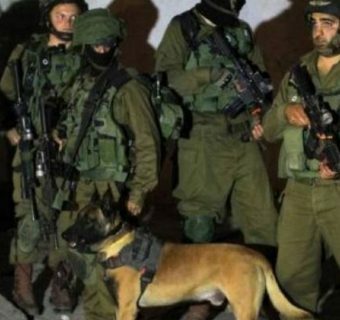 Furthermore, the soldiers invaded Yatta town, south of Hebron, searched and ransacked many homes and kidnapped four Palestinians, identified as Husam Ahmad Makhamra, Hani Mkheimer Ismael Makhamra, Fahd Issam Mohammad Awad, and Ziad Eqab Nawaj’a, 40. In Beit Awwa town, west of Hebron, the soldiers kidnapped one Palestinian, identified as Ezzeddin Masalma, from his home, and took him to Etzion military base. Also at dawn, the soldiers kidnapped three Palestinians in the northern West Bank districts of Tulkarem and Jenin, and took them to nearby military camps.